There are a lot of cheap Chinese CNC machines out there with okay mechanics and terrible electronics. The bearings aren’t complete crap, but the spindle of these CNC machines is a standalone PWM controller with a pot to control the speed. This means you can’t control the spindle speed with LinuxCNC or Mach3. For his Hackaday Prize entry, [SUF] is building a DC motor controller for a Chinese spindle motor that doesn’t use any kind of encoder. The first part of that project is fairly easy; [SUF] has already built a high current driver. The second bit is a little it harder – because these spindles don’t have an encoder, [SUF] will have to read voltage spikes on the motor poles, giving him the RPM of the spindle. From there, it’s a bit of PID code to get this spindle running at a desired RPM and connecting it to a CNC control box. So far, [SUF] has a second version of his board waiting for assembly. In the first version of the board, the switching time for the MOSFET was a little slow, but that’s all corrected in the current revision. It’s a great project to extend the capability of these cheap CNC machines, and perfect project for the Hackaday Prize. [Will] is on the electric vehicle team at Duke, and this year they’re trying to finally beat a high school team. This year they’re going all out with a monocoque carbon fiber body, and since [Will] is on the electronics team, he’s trying his best by building a new brushless DC motor controller. Last year, a rule change required the Duke team to build a custom controller, and this time around they’re refining their earlier controller by making it smaller and putting a more beginner-friendly microcontroller on board. Last years used an STM32, but this time around they’re using a Teensy 3.1. The driver itself is a TI DRV8301, a somewhat magical 3 phase 2A gate driver. The most efficient strategy of driving a motor is to pulse the throttle a little bit and coast the rest of the time. It’s the strategy most of the other teams in the competition use, but this driver is over-engineered by a large margin. [Will] put up a video of the motor controller in action, you can check that out below. Brushless motors are ubiquitous in RC applications and robotics, but are usually driven with low-cost motor controllers that have to be controlled with RC-style PWM signals and don’t allow for much customization. While there are a couple of open-source brushless drivers already available, [neuromancer2701] created his own brushless motor controller on an Arduino shield. [neuromancer2701]’s shield is a sensorless design, which means it uses the back-EMF of the motor for feedback rather than hall effect sensors mounted on the motor. It may seem strange to leave those sensors unused but this allows for less expensive sensorless motors to work with the system. It also uses discrete FETs instead of integrated driver ICs, similar to other designs we have covered. Although he is still working on the back-EMF sensing in his firmware, the shield successfully drives a motor in open-loop mode. The motor controller is commanded over the Arduino’s serial interface, and will support a serial interface to ROS (Robot Operating System) in the future. This shield could be a good alternative to hobby RC controllers for robots that need a customizable open-source motor controller. The PCB design and source code are available on GitHub. [Jack], a mechanical engineer, loom builder, and avid sailor wanted an autopilot system for his 1983 Robert Perry Nordic 40 sailboat with more modern capabilities than the one it came with. He knew a PC-based solution would work, but it was a bit out of reach. Once his son showed him an Arduino, though, he was on his way. 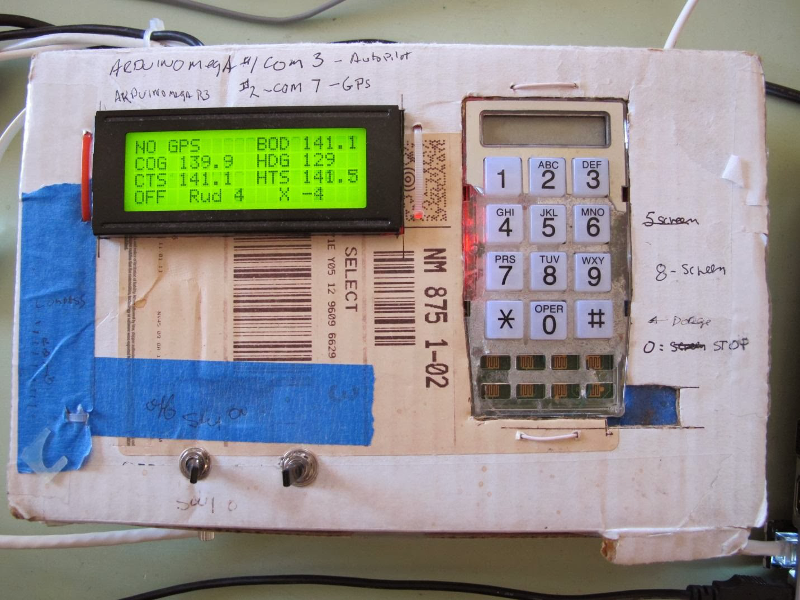 He sallied forth and built this Arduino-based autopilot system for his sloop, the Wile E. Coyote. He’s using two Arduino Megas. One is solely for the GPS, and the other controls everything else. [Jack]’s autopilot has three modes. In the one he calls knob steering, a potentiometer drives the existing hydraulic pump, which he controls with a Polulu Qik serial DC motor controller. In compass steering mode, a Pololu IMU locks in the heading to steer (HTS). GPS mode uses a predetermined waypoint, and sets the course to steer (CTS) to the same bearing as the waypoint. [Jack]’s system also uses cross track error (XTE) correction to calculate a new HTS when necessary. He has fantastic documentation and several Fritzing and Arduino files available on Dropbox. Autopilot sailboat rigs must be all the rage right now. We just saw a different one back in November.